The annual Leadership Lunch for 6 Degrees Youth Initiatives supports the 6 Degrees Junior Fellows, 6 Degrees Young Advisors, as well as cohorts and partnerships with Toronto Pearson, Pathways to Education, CivicAction’s DiverseCity Fellows, and Ryerson University. With speakers including The Rt. Hon. Beverley McLachlin, The Rt. Hon. 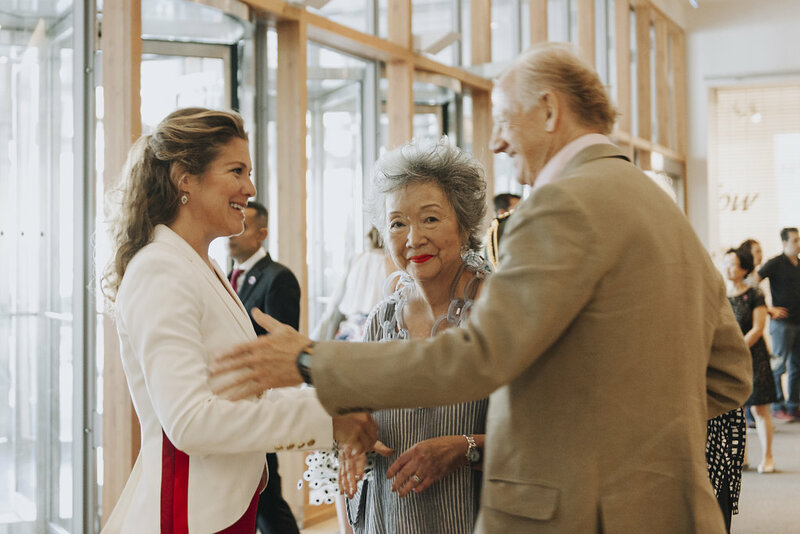 Adrienne Clarkson, Sophie Grégoire-Trudeau, and Tyler Brûlé, this year’s event centered on the theme of Building Bridges, emphasizing the importance of connections — between people, ideas, perspectives, and places. Neil McLaughlin, Head of Personal and Commercial Banking at RBC, spoke to the importance of creating diverse and inclusive teams in the workplace, while Joseph Mancinelli, International Vice President and Regional Manager for the Central and Eastern Canada area of the Labourers’ International Union of North America (LiUNA), spoke about connecting immigrants to new and overlooked opportunities in the construction industry. Sophie Grégoire-Trudeau shared her ideas on the importance of empathy and mentorship for the younger generation as they build a more just society, and spoke about her work with the organization Roots of Empathy. Tyler Brûlé, Editor in Chief of Monocle and Founder and Chairman of Winkreative, outlined five strategies for creating networks of Canadians around the globe to better represent Canadian perspectives and stories. The Rt. Hon. Beverley McLachlin, Chief Justice of Canada, and The Rt. Hon. Adrienne Clarkson engaged in a conversation on the significance of Canada’s cultural diversity and its influence on systems of governance.